Miracle Socks Review and Ratings | Does It Work on Tired Legs? Do Miracle Socks Really Work? 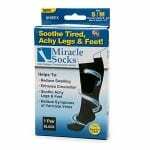 Miracle Socks hope to relieve you of the pain and swelling in your feet and legs. Most of us have experienced sore legs and feet at one point or another, but for some it can be habitual, and unbearable. A pair of compression socks is the usual fix, but those come with some major drawbacks. Can Miracle Socks really be miraculous in providing a solution? Compression socks have been used for many years, and have even been prescribed by doctors as a solution for those who experience swelling in their feet. The problem is that these prescription socks are usually big and bulky, and some people have trouble putting their shoes on after putting these socks on. Traditional compression socks are also not very fashionable, so people didn’t like wearing them in place of normal socks. The claims come fast and furious with Miracle Socks. They start off by saying that it’s great for those who travel, and more and more people are realizing they need to be careful about the circulation in their legs when going on long flights. They say that it boosts circulation throughout the legs, which reduces fatigue. This means you won’t wear out as quickly during your daily routine, and you’ll be able to recover more easily from a day spent walking around or standing for long periods. They also claim that their compression technology is better than those used in medical compression socks. They even state that it can help with cases of plantar fasciitis and varicose veins. Miracle Socks claim that they provide instant relief when you put them on. They also say they it’s great for those who work all day on their feet, and allows them to keep working without getting tired and needing to sit down. They also say that Miracle Socks fit into any shoe, and that they soothe and massage your legs and feet while you are walking, or standing. For people that don’t suffer from leg and foot pain every day, or swelling in areas like the ankles, the entire product might seem like hype. But they are not exaggerating how bad it is to have pain and swelling in these areas. It can disrupt your entire day and make you feel like not doing anything. If your job requires you to be on your feet all the time, this is a very valid problem that needs a permanent solution. They compare the cost of Miracle Socks to the cost of other compression socks costing around $53. If you follow along with this comparison you might be shocked to find out that you can pick up a pair of Miracle Socks for around $15 delivered to your door. This seems like a very reasonable price if they actually do what they claim they can do. If you currently use a pair of traditional compression socks you don’t have to commit to anything extra. Just replace them with Miracle Socks and go about your business. However, if you currently don’t use any sort of sock treatment for your varicose veins, or tired swollen legs and feet, you have to get into the habit of wearing compression socks mostly every day. Once you develop the habit, it will seem like it’s automatic and you won’t even notice at all. Since Miracle Socks always compares itself to traditional compression socks, that’s the kind of evaluation that’s needed in order to make a fair assessment of whether or not they work. Our findings show that they are not the only type of sock like this on the market, and they haven’t received the best feedback from what’s currently available. One trick that marketers use is to make it seem like they have exclusively solved a big problem. But the reality is that there are other companies in the market that are also working at fixing the same problem, and just might do it better. Miracle Socks work, just not as well as you might expect. While they do provide some relief, we feel that the claims made in the promos are exaggerated, and the actual benefit you’ll get from them is mild. Of course, it’s entirely subjective because it’s dealing with pain. One person may say that it provides a lot of relief, while another might say it hardly provides any. With something as subjective as this, it’s sometimes best to give it a try and see what happens. It’s the only real way of knowing if this works for you and your specific situation. It could be that you’re one of the people that would get a lot of relief from it and be really happy with the results. If you’ve tried other compression socks on the market and had no success you can give Miracle Socks a try, because they’re cheap. However, don’t put your hopes into the performance of this product and then be disappointed when you find out that you only get a moderate amount of relief for your tired legs and feet. What do you think? Do Miracle Socks work or not? Does WoW Secrets Really Work? Just like pretty much every other pair of compression socks i’ve tried out i don’t feel they work as well as they claim to. I received my Miracle Socks yesterday and wore them to work today, I work 12 hrs on concrete floors and yes the socks worked, my feet and legs are normally sore when I get off work but today my feet and legs feel great I will be wearing my Miracle Socks at work all the time now Thanks Miracle Socks. Compression socks are pretty much all the same. I work with the elderly, and I don’t notice any difference based on what brand our patients use. I’m not sure why this product claims that traditional compression socks are bulky, because that’s not true. These socks look exactly the same as any other compression socks. There is no such thing as socks that massage the foot/leg or “stimulate” circulation. The ONLY thing these socks or any other compression socks do is prevent swelling. That’s it. Also, I’m not sure why they compare their socks other compression socks costing $53-most compression socks cost between $10 and $20. Thanks for your comment, April, as it really shed some light on how these types of socks work. I always wondered how exactly they got to work preventing soreness, and I now I get it! I work for long hours on my feet, and I was thinking about getting these, but I may shop around and see the variety of options out there from other brands first. It seems like they work at least a little to relieve pain after a long day on your feet, and I would be happy even with just that. Sometimes I come home after work and my legs and feet are so achy I have to lie down, so I really can’t stand it. I used them as a nurse’s aide for patients with diabetes and I have to say that it is no different than Med Peds. It is a compression sock and that is that. I used them as well because back then, I was on my feet way too much and my family have a tendency for varicose veins. Any compression sock is good to be sure you don’t aggravate the situation and you are able to walk around, assist patients and do so in comfort. The price is OK but as I stated before Med Peds that you can find online or in a department store is just as good so I guess it is individual preference. I agree that any kind of compression sock is a good compression sock, as long as the elastic at the top isn’t too tight – which will actually aggravate the very problems it is supposed to help. The key thing is putting them on right. Also – remembering to wear them! I worked long hours – days and nights – in hospitals for years, and now that my daughter is going to be doing the same thing I have recommended compression stockings sooner than later. Hopefully, these socks can live up to their name – I’ve always thought companies were very brave to put the name ‘miracle’ on anything. Fortunately, I do not suffer from swelling or pain in my feet and legs, but I do have relatives that experience that persistent discomfort. For someone that experiences pain on a regular basis and cannot stay on their feet for long periods of time, some sort of product to relieve that is an attractive prospect. Miracle Socks are not especially miraculous but they do alleviate some of the discomfort. That said, there is a whole range of different compression socks on the market. This is not a new concept or nifty invention. If you suffer from pair in the lower legs and feet, shop around and consider the best product for you. Or ask your doctor. I have fibromyalgia and sciatica (left leg) so very often have achy legs, especially my left leg hip, thigh, calf and foot. I have tried a different brand of compression socks that were soft and comfortable, although rather thick and bulky ~ and gave me no deep relief of discomfort (wore them for warmth all winter). While out shopping yesterday (with very tired, achy legs), I saw a display of Miracle Socks and decided to try them. I took them out of the package and they felt thin and a bit more structured than the other brand I had tried. After getting home, I put them on, following the directions, and to my delight I got IMMEDIATE relief! I wouldn’t stop talking about them to my husband all night! I just put them on again tonight and voila! instant relief. (My legs almost feel cool and weightless in these.) Love them and will buy them for my family and friends! Bought these at Bed, Bath & Beyond because I always wanted to try compression socks since I now work retail. These socks are great! Noticed no more swelling and my feet don’t hurt plus they fit in my loafers which is part of my uniform for work. I will be buying more. I ordered Miracle Socks from “As Seen On TV” and I’m more than satisfied with the results. I weigh a ton (400 lbs) and my legs are just as big as my feet (size 13). These sock work so well that I want my Mom (age 88) and my older cousin who both suffer with the same medical condition to have a pair. The socks work so well, I’m willing to buy them from my cousin if they don’t satisfy her. Most of my family have diabetes, but I don’t, I do have osteo arthritis with severe leg swelling and discolored skin. I have tried other socks that claim the same but none have actually performed the miracle along with the satisfaction that Miracle Socks have. The size x-large actually did fit my large calfs and big feet to match. I will be buying more and adding the white color in the near future……Ms. Thompson. All compression socks should be gradient compression to reduce swelling. These socks are not and could actually promote swelling. There is not reference to the level of compression in there advertising. The individual with leg swelling should be wearing at least 20-30 mmHg (this is a pressure) gradient compression socks. The box of label on the sock should clearly state it is a 20-30 sock. Can the miracle socks be worn while sleeping?